If a bad haircut was fatal, you would be very choosy about your hairstyle. 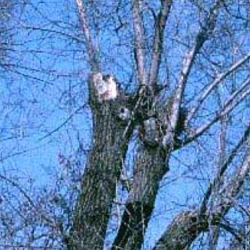 But each year, hundreds of homeowners have their trees pruned by topping, a horticultural “bad haircut” that shortens the life of the tree and leads to greater expense later.Tree care professionals and university experts caution tree owners that topping a tree is the kiss of death in many instances. This damaging pruning practice can shorten the life span of trees significantly, and the damage is long-term; in some instances, the beheaded tree will die within a few years, if not less. Many people don’t realize topping is a poor practice because trees can be remarkably effective in overcoming the damage in the short term – some can take years to die, a few can even withstand multiple toppings. So the real damage is not easily noticed by the tree owners until the trees can no longer survive such a drastic removal of canopy. People see trees leaf out year after year and give little thought to the actual effect of the topping. The most immediate effect is a reduced leaf mass, or crown. This smaller number of leaves reduces the amount of energy the tree manufactures to sustain itself. Less energy causes the roots to die back as well. This creates a tree that is less able to supports itself or withstand heavy winds. The haircut analogy breaks down when you look at what happens after the tree topping occurs. Whereas hair just continues to grow out from the same follicle, branches do not continue to grow out from the same growing point. Tree limbs sprout from previously dormant buds just below the internodal pruning cut. This causes an unhealthy flush of growth near the end of the poorly pruned branch that is typically thin and weakly attached to the tree’s main growth stems. These weak limbs are easily ripped from the tree in storms, causing damage and creating a liability for property owners. It has been long known that tree topping is harmful to trees, yet the practice of tree topping continues. Reputable arborists will work with a tree’s natural growth habit when pruning and understand the importance of pruning and tree health. Proper pruning can extend the life of a tree and reduce ongoing homeowner expense; however, once a tree is topped, it will require much more frequent pruning to prevent branch failure, costing the owner more money. The best advice is to hire reputable tree care companies that have recognized qualifications and insurance. Ask the company for credentials from professional organizations such as the International Society of Arboriculture and the Tree Care Industry Association to prove their knowledge and abilities. Also ask for references of where they have pruned trees at other properties to see what their work looks like after the project. A homeowner wouldn’t hire a plumber or carpenter without references, so why shouldn’t an important asset to your property like trees not receive the same consideration? Trees are a valuable resource and asset to your property that helps make our environment cleaner, healthier and a more beautiful place to live. Those trees deserve better than a life-shortening bad haircut.